Conor McGregor goes face-to-face with Floyd Mayweather during a press conference during "Mayweather vs. McGregor World Tour." 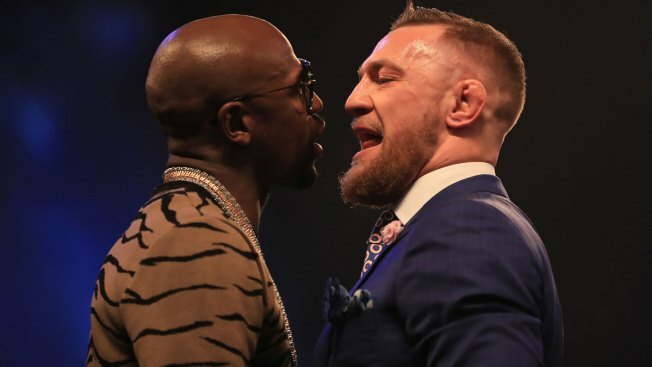 Combat sports and TV experts say the Connor McGregor-Floyd Mayweather fight should be the biggest pay-per-view event in history with more than 50 million watching in the U.S.
Saturday night's fight threatens the pay-per-view revenue record set by Mayweather and Manny Pacquiao two years ago. McGregor's UFC fans and the curious drawn by his trash-talking could help this event dwarf the overall viewership record, as people use the fight as a reason to have friends and family over for an hour of escapism.